A lightened up, gluten-free, vegetarian spin on the delicious Italian Fettucine Alfredo. Molto bene! I don’t know if I’ve ever mentioned this, but I’m really big on pasta. Last night, as I was getting ready to head home from work, I called Mr. Crumby to ask what he was making for dinner. His response? Salmon with rice and veggies. Nope. I’d eaten fish 3 meals in a row. Executive decision time. I had been craving spaghetti all day, and before he knew it, his menu had changed. Guys. I think it was the most satisfying spaghetti I’ve ever eaten. Full of cheese and garlic and the cutest little meatballs, with a freakin’ slab of garlic bread on the side. Mmmm. Carbs. In case the pictures don’t give it away, this is not that spaghetti. BUT, it is one of the healthiest, not to mention tastiest, alternatives I’ve had. And the craziest part is the noodles are made from sweet potatoes! First thing’s first. I will never give up pasta. You’ll have to pry the fork from my cold, dead hands first. But, there’s nothing wrong with healthy eating every now and then, and with the Briefton’s NextGen Spiralizer, it’s even easier to work more fruits and veggies in to your diet. 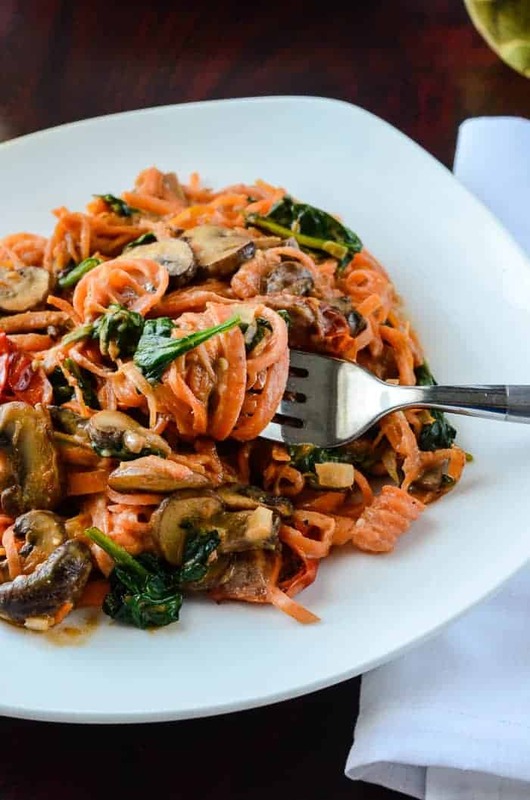 Enter this Sweet Potato Noodle Tomato Mushroom Alfredo. Believe it or not, it took me a while to get the hang of using this bad boy. Spiralizing the zucchini was easy, because it was a uniform shape. The sweet potatoes I used in this recipe, however, weren’t the most cooperative veggies. When using this spiralizer, be sure your veggies are thick, firm and straight, otherwise you’ll be spinning at awkward angles and your “spoodles” won’t achieve noodle status. Mine came out right, but not after a struggle. I also found that when I got to the point where it got too difficult to spin the vegetable, the spiny “innovative cap” they provide didn’t do the job as well as a sturdy dinner fork. That said, once I figured out the best way to handle it, the spiralizer did the job wonderfully. So, we start with a healthy, filling sweet potato “noodle” base. How do we keep an Alfredo dish light. you ask? With low-fat milk and cheese, of course! And then throw even more vegetables in it for good measure. The lightened up Alfredo sauce is truly delightful, and the addition of homemade tomato sauce gives it a nice light zing. 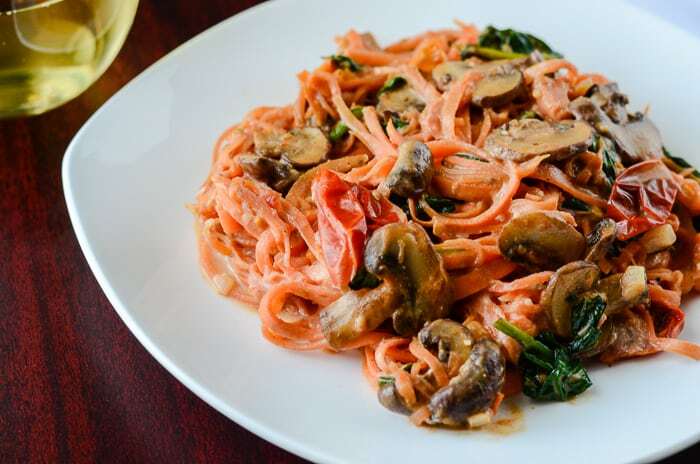 The mushrooms and spinach go well with the hearty sweet potato, but overall, the dish as a whole isn’t heavy. Mr. Crumby, however, was left wanting. He kept saying how good it was, but asking where the pasta was. I guess no matter how hard you try, there’s just no replacing the carbs for some people. A lightened up, gluten free, vegetarian spin on the delicious Italian Fettucine Alfredo. Molto bene! Peel sweet potatoes and spiralize in to medium bowl. Set aside. Bring water to a boil in a small saucepan. Cut an ‘x’ in the bottom of your tomato, and blanch it in the boiling water for two minutes. Remove from water and let cool for a few minutes before peeling off the skin at the ‘x’. Roughly chop tomato, or place in a blender and pulse until chunky. Heat 1 tablespoon olive oil in a small sauce pan over medium heat. Add garlic and shallot and saute for 3-4 minutes until fragrant. Add tomato and boil, stirring occasionally, until thickened and saucy, about 15 minutes. In another saucepan, melt butter over medium heat. Whisk in flour until lightly browned to create a roux, about 1 minute. Gradually whisk in milk and cook, whisking constantly about 1-2 minutes, until incorporated. Stir in heavy cream and garlic powder until mixture is slightly thickened, about 1 minute. Stir in Neufchatel and Parmesan until melted, about 1-2 minutes. Stir in tomato sauce, mixing until incorporated. Season with desired amount of salt and pepper. Heat remaining tablespoon of olive oil in a large skillet over medium heat. Add mushrooms and saute for 3-4 minutes, until they begin to brown. Add tomato halves, stirring gently, and cook another 2-3 minutes. Add spinach and allow to wilt, 1-2 minutes. Pour veggies in a small bowl. Without cleaning the pan, return it to medium-low heat and add the spiralized sweet potato noodles. Cook, stirring occasionally, for 5-6 minutes until crisp-tender. Return mushroom mixture to skillet, then pour Alfredo sauce over and toss to coat, allowing everything to heat to uniform temperature. Serve & enjoy. Very cool! I imagine it tasted great. How was the texture? Perfect! A lot like al dente pasta, but with more flavor. This would be something fun to try! I hadn’t thought of using a sweet potato like this! I do love sweet potatoes but I have never had them cooked like this! I wouldn’t mind giving this dish a try. I like all of the ingredients but haven’t tried them together like this before. It is definitely worth a try for me! 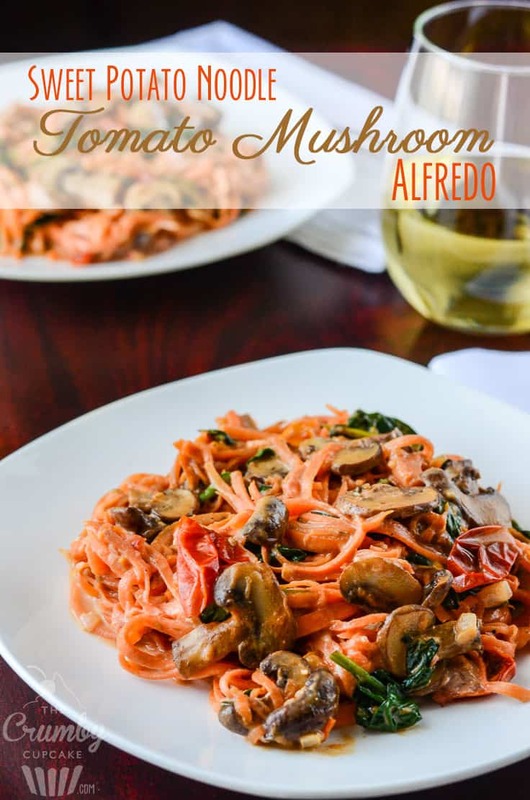 Your Tomato Alfredo sauce sounds delicious too!! The Alfredo sauce was my favorite part. 🙂 I’m a sucker for cheese! This recipe sounds awesome! I have never thought to use a sweet potato this way. The noodles are much better than I anticipated. If you like veggies, you’ll like them! You can almost trick your brain in to thinking it’s actually pasta! Omg this sounds delicious!!! Never would of thought of putting sweet potatoes in Alfredo! Sounds so yummy!! Oh my. I got a veggie spiralizer for Christmas this year and hadn’t even thought of using sweet potatoes with it. I will have to try this recipe out for sure! Hmm… I bet this spirilizer would work for making my Broccoli slaw too… I always cut the broccoli stalks by hand and it takes FOREVER. That sounds like a much easier way to do it, for sure!! This is such a clever and unique recipe idea! I am loving all the flavors happening here! 🙂 And sweet potato noodles?? Genius! Thank you, Carrie! It has a lot of flavors for sure! This looks so delicious! I would love to try this! Thanks for posting! This looks delicious. I usually think white sauce, but I love your recipe. Although I’m not a huge fan of mushrooms, this pasta looks so so good! I would make veggie pastas! 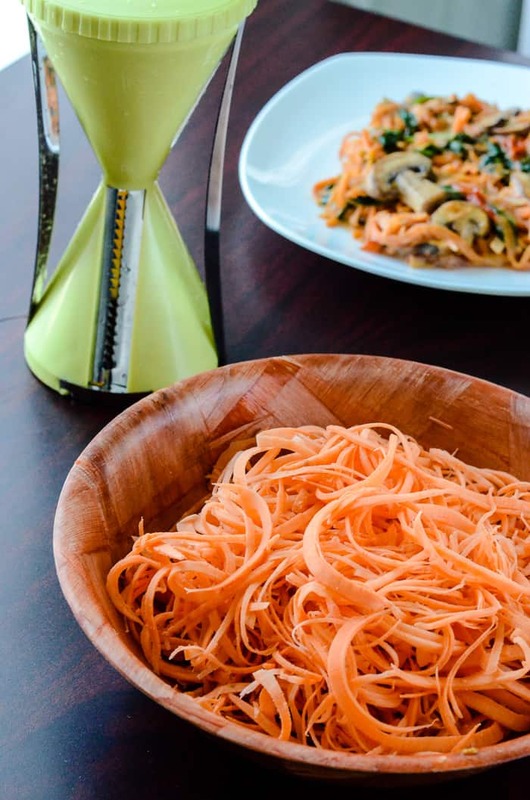 I’d use the Spiralizer to make “pasta” using veggies like zucchini or carrots. I would love to win a Spiralizer like this! 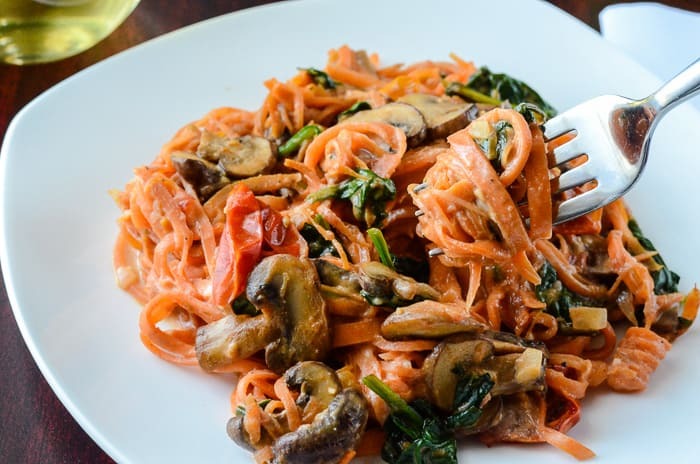 I would use it to make spiralized zucchini noodles, but your sweet potato noodles look very good! 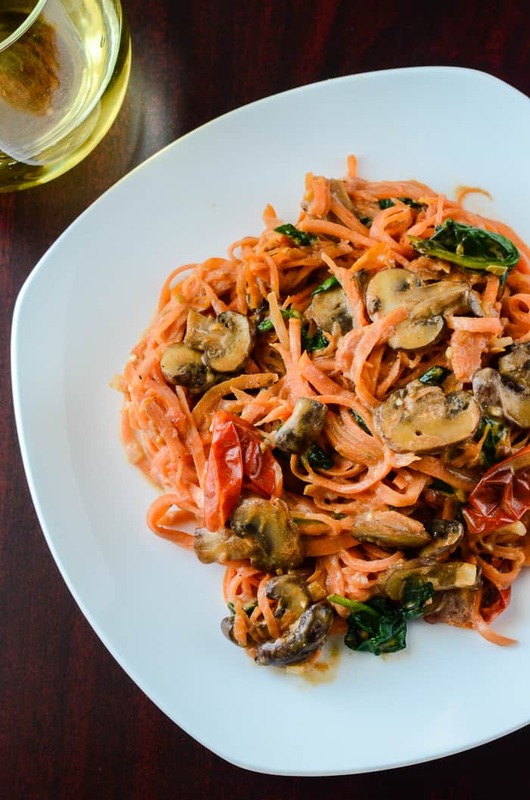 This is the first time I’ve seen a recipe using sweet potatoes in lieu of pasta…will definitely be trying it soon…thanks for the recipe & the chance to win! I still have not given into the vegetable noodles. I really must give it a try because this dish looks amazing! I didn’t know how to feel about them either, but it’s definitely a nice change of pace for dinner! Well, this product is brilliant, and I’d be using it to make all kinds of veggie noodles. Because, like you, I love me some pasta… but there’s nothing wrong with making it a little healthier! And the Spiralizer seems way easier to use than a peeler, taking layers off zucchini or sweet potatoes. I’m no mushroom fan, but I’m intrigued by this recipe. If nothing else, it could be made with mushrooms (because Winston LOVES them) and I could pick them out… Nice work, lady! Yum. I can’t wait to try this recipe! I miss pasta so much, and I’m always looking for healthier alternatives. This dish is absolutely gorgeous, too. I would use the spiralizer to make this dish for sure! I would use it with zucchini and sweet potatoes! I would make all kinds of veggie pastas and soups. I would make a zucchini pasta instead of buying pasta made of flour. I have seen some great salads using spiralized vegetables that should be quite healthy! I’d love to try them out. Wow, looks fun and delicious.. I’m thinking Veggies Pasta would be good! I think it would be a fun way to make recipes healthier!